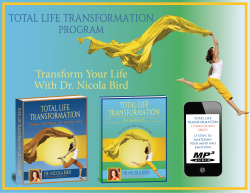 If you wrestle with confused feelings, negative thoughts, and issues in your relationships, or notice that the same problems recur, then free yourself from what psychotherapist Dr. Nicola Bird calls “The Boomerang Effect”. It is possible to gain control and change unhealthy patterns to generate harmony in your life. By using a five-minute formula, you will empower yourself and revolutionize your life in positive ways. You can avoid stress and problems by using Dr. Bird’s transformational method that has already liberated many people from persona struggles. Her proven self- empowerment formula can help you take charge of your life and create positive changes. How managing perception can help you change your life. This self-empowerment guide will allow you to begin a journey that opens up possibilities in life. 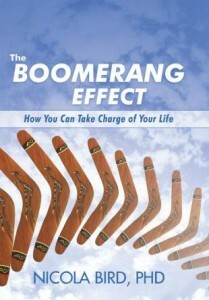 Equip yourself with the tools you need to take charge of your life and avoid “The Boomerang Effect”. I was introduced to Dr. Nicola Bird's work through a podcast on Emotional Eating at [...]. After listening to the podcast several times, I reluctantly bought her book. I say 'reluctantly' because I have bought so many 'self-help' type books through the years that I have become a bit jaded. When I bought the book, I set it aside for about a month. After all, what could Dr. Bird 'tell me' that I had not already heard. The problem was: I was still binge eating. Binge eating being the problem that got me into therapy years ago, and buying all those other 'self-help' books. I finally opened Dr. Bird's book when I realized I was boomeranging from a low calorie diet. Dr. Bird's style is simple, clear, and effective. When she gets to her solutions--and this is important--they are also simple, clear, and effective. In March 2012, I chose to work with 2 of the exercises she presents in her book. Although I wasn't thrilled to be be trying 'another thing,' I think Dr. Bird's comforting, supportive, and engaging writing style helped me through my resistance. From the first day I committed to experimenting with Dr. Bird's exercises, per her suggestions, I began achieving positive results. I did not stop binge eating overnight, but I slowed down significantly. This was without any other intervention. Three months later, I am no longer binge eating. And not because I am on some rigid food plan and/or because I have eliminated sugar and/or white flour/things from my diet. I am not binge eating because: 1. When I feel stressed out, I use one of Dr.Bird's exercises.They are more effective and comforting than binging. 2. The exercises do not leave the negative effects and baggage of eating too much food. 3. They don't cost anything to do them. The most wonderful thing about all this is the positive effects on the rest of my life: work and relationships. I cannot recommend this book highly enough. It has changed my life. I intend to continue using these simple, but powerful exercises everyday for the rest of my life. They feel and work much better than binge eating. In defining the Fighter, the Hider, and the Runner, Bird enumerates their characteristics, informs the reader of the results of each behavior, and offers potential “antidotes.” Two unique elements will resonate with readers as they try on the different hats of each role: The Reasoning and the Mantra are very specific attributes. For example, Mi-mi the Hider’s Reasoning is: “What if …?”; and the Hider’s Mantra is: “It is what it is.” These are just two examples of how the author presents definitive, rather than generalized, information. The programmed responses that the author details are based on the fight-or-flight response. Bird takes it one step farther and adds “freeze” as the third typical response in this series. She explains that people don’t always run or hide; stopping dead in their tracks is a typical alternate response to anxiety, fear, depression, and other emotional issues. The chapters end with a practical “Recap of Key Concepts” that highlight the definitions provided within the chapter and the characteristics of each archetype. The exercises include instructions and, when the reader is asked to provide descriptions of challenges and emotions, Bird offers a list of possible responses to jog the reader’s mind. Bird cuts to the chase—people have pain and want results—but she cautions that there are no permanent fixes. Problems will rear their ugly heads, but she gives readers tools that are easy and quick to use and provide relief. Gentle and direct reminders pepper each chapter: love yourself, take care of and be good to yourself, and practice the four exercises. Bird delivers her point of view clearly, succinctly, and lovingly. The book appears to target women and has men in the “Mucky” roles until page 29, when Mark makes an appearance as the author’s patient in a “Mi-mi” role. The author employs feminine pronouns throughout the text, and there’s not much advice for men, other than in Mark’s brief segment. Nicola Bird received her doctorate from the University of Toronto, and she lives in Toronto today. In addition to maintaining her private psychotherapy practice and writing, she conducts seminars based on SIT. © 2014 Nicola Bird. All rights reserved.